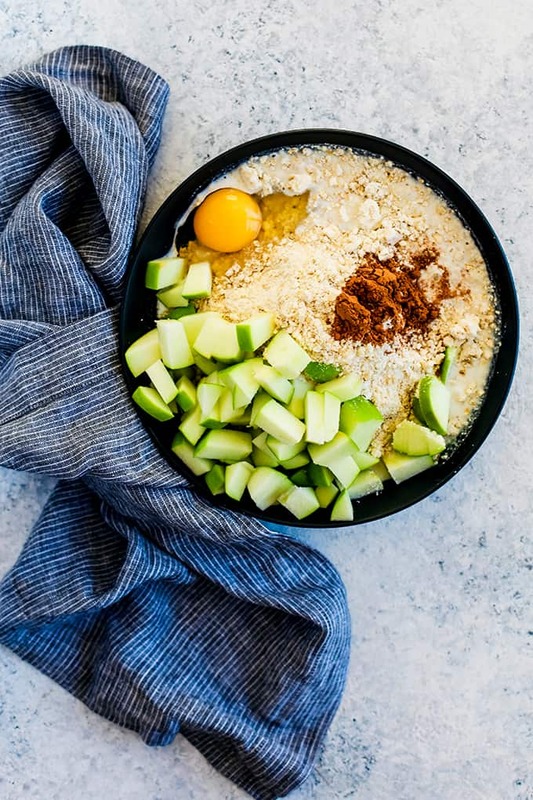 Just five minutes of prep is all that stands between you and a dozen of these delicious and insanely easy Cinnamon Apple Oatmeal Muffins. Original content posted September 2014. Updated September 2018. Five. 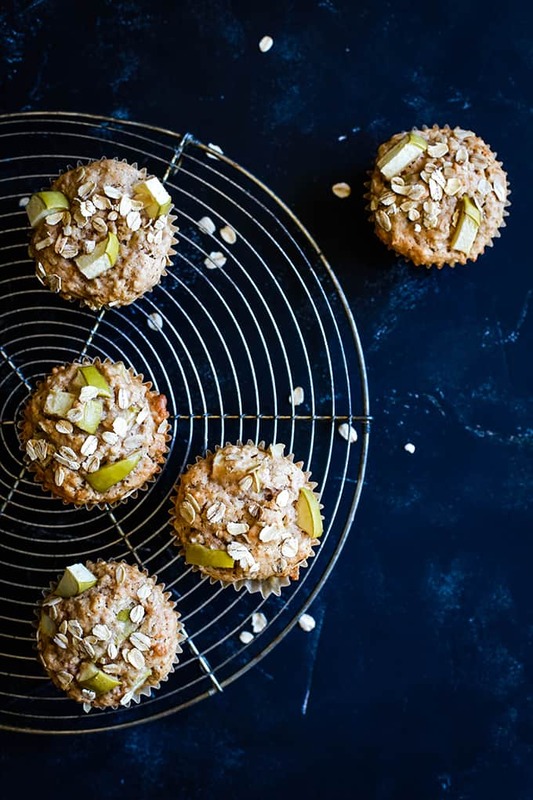 Just five minutes of prep is all that stands between you and a dozen of these easy Cinnamon Apple Oatmeal Muffins. That means by the time the timer goes off and you open the door of your oven to revel in their deliciousness, you’ve already cleaned up the kitchen and poured yourself a glass of milk to enjoy one or two of them. Or five. I won’t tell. Five minutes of prep, you ask? Absolutely! These muffins get their quick start thanks to three cups of my Homemade Oatmeal Muffin Mix. This is the same muffin mix that is used in my Pear Macadamia Oatmeal Muffins as well as my children’s favorite Oatmeal Chocolate Chip Muffins. Besides the oatmeal muffin mix, you need just two apples – Granny Smiths are my favorite for these Cinnamon Apple Oatmeal Muffins! – an egg, milk and cinnamon. To me, the apples and cinnamon, area a classic autumn – or anytime! – flavor combination. No need to pull your mixer out of the cabinet or grab any other special equipment. 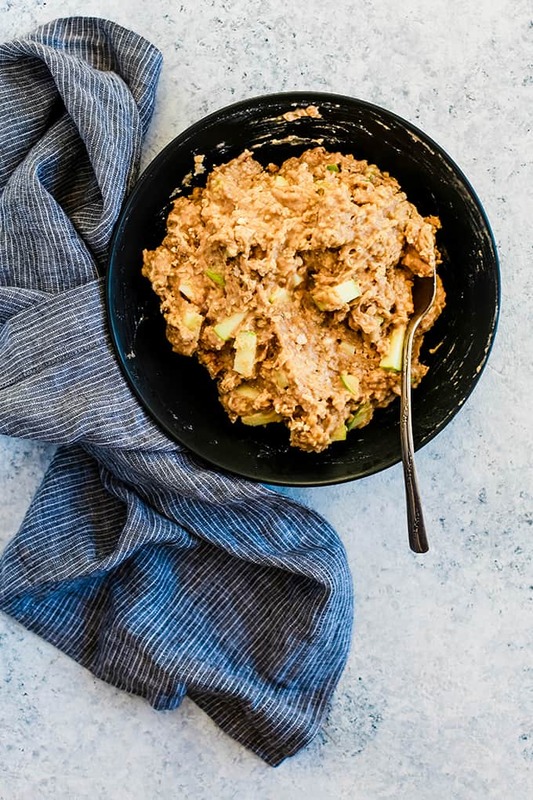 To make these Cinnamon Apple Oatmeal Muffins, you simply need a bowl and a spoon. The five ingredients are stirred together and in a minute or less. 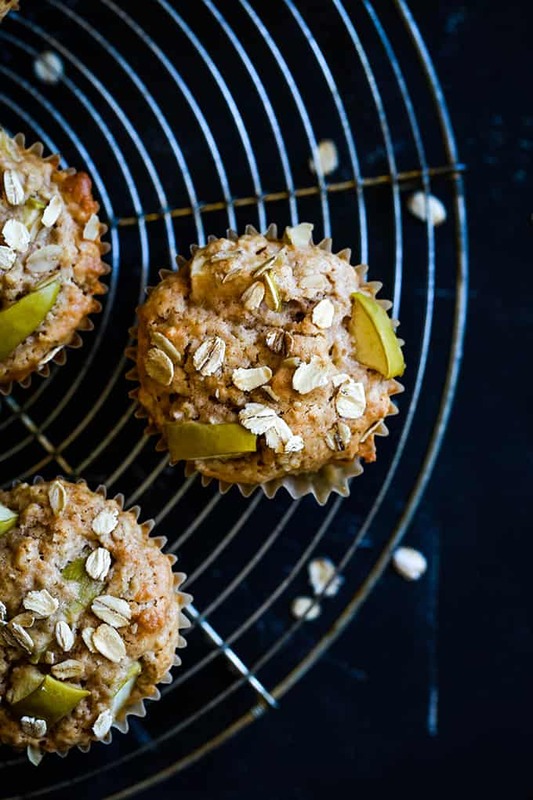 The key to perfectly uniform Cinnamon Apple Oatmeal Muffins? A large cookie scoop. I’ve been using one of these scoops to make muffins for over ten years and can’t imagine not having it my kitchen. Want to up the apple quotient in these muffins? You can make these Cinnamon Apple Oatmeal Muffins with applesauce as well. Simply substitute 1/4 cup of applesauce for the egg called for in the recipe. 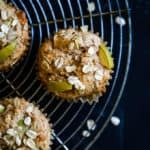 If you’re willing to go one extra step to make these Cinnamon Apple Oatmeal Muffins truly bakery worthy, I love to add a few extra diced apples to the top of each muffin along with a sprinkle of oats prior to sliding them into the oven. The difference in what the final product looks like is astounding! 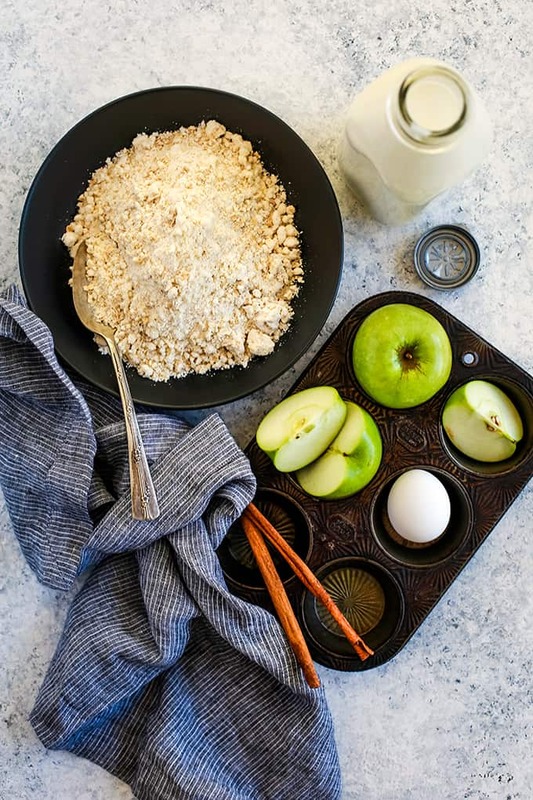 Just five minutes of prep is all that stands between you and a dozen of these delicious Cinnamon Apple Oatmeal Muffins. 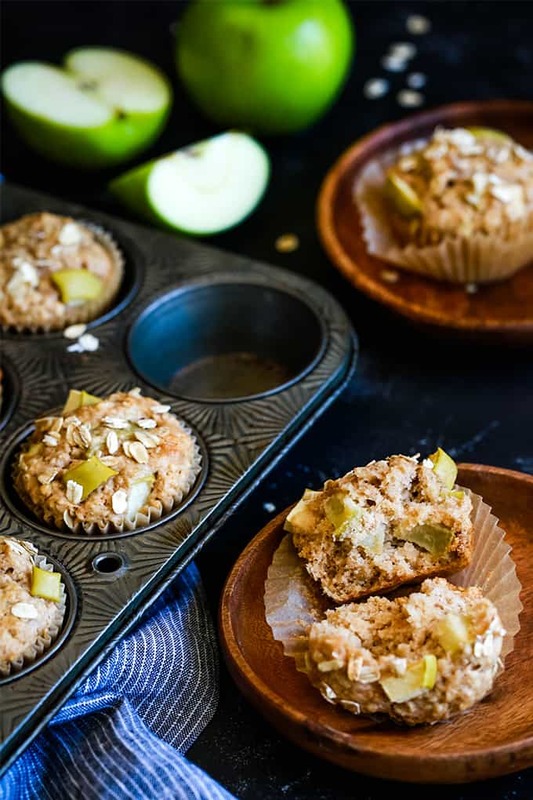 A jumpstart from a homemade oatmeal muffins mix and seasonal apple and cinnamon flavor combination make these muffins a winner each and every time! In a large bowl, add muffin mix. Stir in cinnamon, milk, egg and apple until just combined. Using a large cookie scoop, add one scoop of batter to each muffin well. Bake for 20-25 minutes or until a toothpick inserted in the middle removes cleanly. Fans of the classic autumn flavor combination of apples and cinnamon will also love this Cinnamon Apple Pie Bread, these Pressure Cooker Cinnamon Apple Steel Cut Oats and these mashup Cinnamon Apple Streusel Bars. What a great afternoon snack or start the day off with serving these for breakfast. I love to have a big family breakfast on the weekends! This will be happening soon! I'm sure they'd be a hit, Abeer! My whole family loves muffins. We are always trying new recipes! We need to make this soon! Those look so good and I've no doubt they smell heavenly! They do smell amazing, Kimberly! Boy oh boy I do love apple season! I want these for breakfast asap!! Hope you'll give them a try, Dorothy! These are just so wonderful for fall breakfast! I've been digging all things oatmeal lately, so these sound *perfect* for me! Melanie, what a great mix to keep on hand to make muffins! And the idea to give the mix away as a gift to a teacher is perfect! Thank you for sharing this recipe to make muffin baking easier. 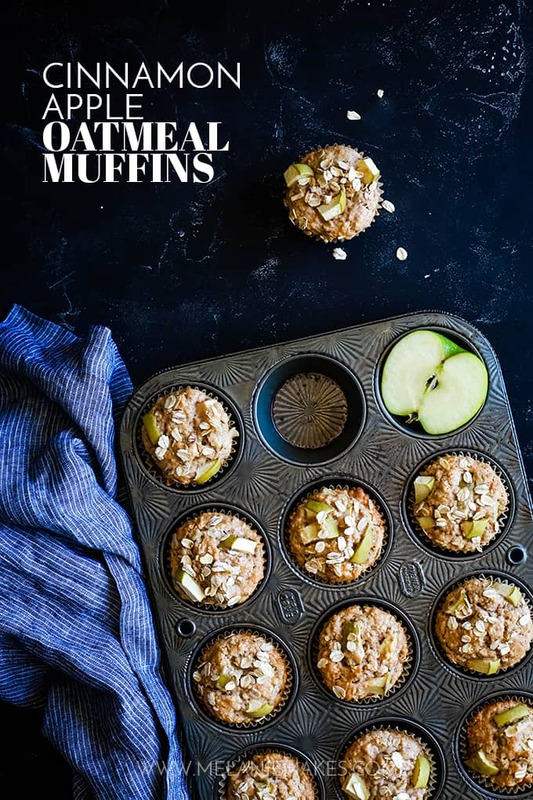 These apple oatmeal muffins look perfect for breakfast and so delicious too! Thanks, Joanie! I keep a large jar of the mix in my pantry so it's always at the ready! These muffins! Awesome & love that with the pre-prep, they're practically ready to roll! Love it! Five minutes of prep?! Oh I am so about these! LOVE LOVE oatmeal muffins! ... I also love that you have your own starter! Looks delicious, Melanie! Thanks so much, Justine! Having your own mix definitely makes life easier! I initially made your homemade mix to try the twix muffins. Those were yummy, but mine turned out a little dry so with other variations I have just added a little more banana or some yogurt or apple sauce and have had great luck. For this apple/ cinnamon recipe, I already had some jarred apple sauce/slices that my kids didn't like out of the jar. I just subbed 1-1/2 cups of the apple sauce/slices (chopped) for the fresh apple and they turned out great! The muffin mix really does make the whole process go a lot faster. I am on my last bag and will be making more when that is gone. Thanks! So glad that you're enjoying the mix, Darcy! Curious about the dry muffins as I haven't experienced that issue. Let me know if you need any suggestions to remedy! Hi, Lynne! Thank you so much for your kind words! I typically use Crisco for the muffin mix and have also used shortening purchased at Aldi with great results. Let me know if you give the muffins a try! Nothing beats a good homebaked muffin.. and these look so incredibly delicious that I could definitely devour a couple right now! Loving the cinnamon and apple flavour too. Thanks for the recipe, you can consider that I will be making it! Thanks so much, Thalia - let me know what you think if you give it a try! This recipe looks like fun. The only problem is I do not have muffin tins, Could I make it as a bread instead? Would I need to make any changes to the recipe? I can not wait to try it. Hi, Kimberley! No muffin tins?! I'll gladly lend you one of mine as I must have at least four - can't get enough muffins and cupcakes! :) I haven't tried this recipe as a bread so I'm not sure what specific alterations you'd need to make. If you try it, would love to hear your results! Thank you for the recipe. Just love that I can make most of the recipe ahead of time. You're welcome, Lizette - and I totally agree! That is an adorable packaging idea for some delicious-looking muffins! Thanks so much, Julie! Isn't Jennifer clever? 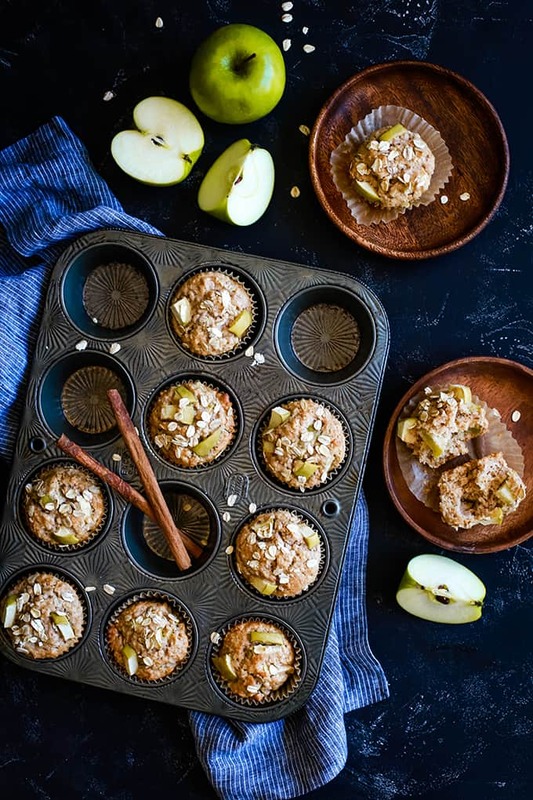 Any combination of cinnamon, apple and oatmeal is great in my book - These muffins look wonderful, Mel! Do you know if the homemade oatmeal muffin mix would work with gluten free flour and gluten free oatmeal? 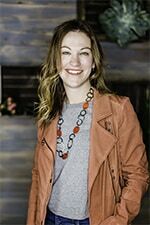 Hi, Kathy - Unfortunately I haven't tried the recipe using gluten free products so I can't say for sure if it would work or not. If you try it, let me know the results! Can't wait to try these. How do you store the muffin mix? Hey, Lynne! I usually store in mason jars or zip top bags in 3 cup increments and store in the pantry. Oatmeal muffins are the absolute best, I adore them! I think I need to pick up the mix you've mentioned here,. Yes you do, Amanda - let me know if you give it a try! Totally genius! I loved your muffin starter recipe, and knowing that it just takes 5 minutes of prep once you've made that... SO dangerous! Especially since I can never stop at one muffin. Or even two. ;) Already pinned! I agree, totally dangerous, Amy! Let me know if you give them a try! And stay tuned for a few more recipes using this mix! I adore oatmeal muffins but you made them even better with cinnamon and apples. There could not be a better combination. You're so kind - thanks, Christie!